Today we have another one of our fantastic Fall 2012 Flash Fiction winners joining us for a chat. Virginia McRae wrote an insightful piece called How Do You Greet A Ghost? If you haven't had a chance to read it yet, check it out by clicking on the title, then come back here to meet Virginia. Virginia McRae lives with a beloved old cat in an old house in a small town in the far northwestern part of New Jersey, near the Delaware Water Gap. She has a law degree but moved to publishing. Recently retired as an independent copy editor specializing in cookbooks, she now has time to devote to completing the draft of a mystery novel set in ninth-century China. Inspired by the ever-popular Judge Dee mysteries of Robert Van Gulik, her own mystery reflects her lifelong passion for Chinese history and culture. She is also completing short stories, some with Chinese settings. She has twice won first prize in the District of Columbia Bar Association’s short story competition, and also won first prize in the Westmoreland Arts and Heritage Festival Short Story Contest, as well as winning third prize in the same contest. She was a winner in one of the Fish Publishing international short story contests. Her poetry has been published in literary journals. A lover of old books, especially of the Victorian and Edwardian eras, and of classical British mysteries, she is currently luxuriating in the eighteenth-century journals of James Boswell and the complete two-volume collection of Sherlock Holmes. WOW: Congratulations on making the list of runners-up for our Fall Flash Fiction contest! Can you start with telling us a bit about yourself? 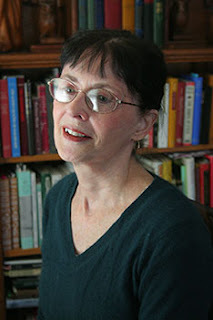 Virginia: For some years I was an independent copyeditor for commercial fiction and nonfiction. I'm no longer working as a copyeditor and so I’m now free to return to reading the old books I love--such as The Complete Sherlock Holmes-- and to write my own stories, which are a little old-fashioned. WOW: I think we need more stories like that today. You mentioned being a copywriter. Have you always been a writer? Tell us that moment when you knew it was something you wanted to pursue. Virginia: I didn’t take up writing until I was middle-aged and won first prize in a writing contest for members of the DC Bar Association. Winning the prize made me want to keep going. I've written on and off since then. WOW: That is wonderful. And I’m not surprised that your work has placed in contests before. How inspirational. Your story, How Do You Greet a Ghost? was a beautiful mix of humorous and touching. Please tell us the background of this story and how it unfolded. Virginia: The story is based on something that actually happened to me in the local A&P. It unfolded just as it's written. The ending is my secret! WOW: Ha ha! Well, it had me tearing up by the end wanting to hear how it all turns out. Any upcoming writing projects in the works or that we should watch out for? Virginia: I’m working on several short stories at the moment as well as a historical mystery novel, which at the rate I'm going will probably take me years to finish. Like any historical novel, it takes a lot of research--more research than writing, or so it sometimes seems. WOW: It does take a lot of research for historical novels, doesn't it? You’ll have to come back and share it with us once you get it published. Now before we let you go today, can you please give us your top three writing tips to writing solid flash fiction. Virginia: I'm no expert on flash fiction, but for me the three most important things are to cut, and cut, then cut some more--let go of things, no matter how precious they are. WOW: Excellent advice, Virginia. Thank you for joining us and congratulations again! Congratulations on placing in the top ten in the contest! I love that you didn't start writing until later in your life. Never too late to BLOOM!